Today many Inuit follow Christianity, but traditional Inuit spirituality continues as part of a living, oral tradition and part of contemporary Inuit society. Inuit who balance indigenous and Christian theology practice religious syncretism. The Inuit cosmos is ruled by no one. There are no divine mother and father figures. There are no wind gods and solar creators. There are no eternal punishments in the hereafter, as there are no punishments for children or adults in the here and now. Traditional stories, rituals, and taboos of the Inuit are often precautions against dangers posed by their harsh Arctic environment. Knud Rasmussen asked his guide and friend Aua, an angakkuq (spiritual healer), about Inuit religious beliefs among the Iglulingmiut (people of Igloolik) and was told: "We don't believe. We fear." Authors Inge Kleivan and Birgitte Sonne debate possible conclusions of Aua's words, because the angakkuq was under the influence of Christian missionaries, and later he even converted to Christianity. Their study also analyses beliefs of several Inuit groups, concluding (among others) that fear was not diffuse. First were unipkaaqs : myths, legends, and folktales which took place "back then" in the indefinite past (taimmani). Among the Canadian Inuit, a spiritual healer is known as an angakkuq (Inuktitut) or Inuvialuk: ᐊᖓᑦᑯᖅ angatkuq. The duties of an angakkuq includes helping the community when marine animals, kept by Takanaluk-arnaluk or Sea Woman in a pit in her house, become scarce, according to the Aua, an informant and friend of the anthropologist Rasmussen. Aua described the ability of an apprentice angakkuq to see himself as a skeleton, naming each part using the specific shaman language. The Inuit at Amitsoq Lake (a rich fishing ground) had seasonal and other prohibitions for sewing certain items. Boot soles, for example, could only be sewn far away from settlements in designated places. Children at Amitsoq once had a game called tunangusartut in which they imitated the adults behavior towards the spirits, even reciting the same verbal formulae as angakkuit. According to Rasmussen, this game was not considered offensive because a "spirit can understand the joke." 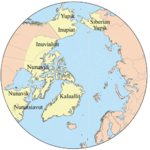 The homelands of the Netsilik Inuit (Netsilingmiut meaning "People of the Seal") have extremely long winters and stormy springs. Starvation was a common danger. While other Inuit cultures feature protective guardian powers, the Netsilik have traditional beliefs that life's hardships stemmed from the extensive use of such measures. Unlike the Iglulik Inuit, the Netsilik used a large number of amulets. Even dogs could have amulets. In one recorded instance, a young boy had 80 amulets, so many that he could hardly play. One particular man had 17 names taken from his ancestors and intended to protect him. Tattooing among Netsilik women provided power and could affect which world they went to after their deaths. Nuliajuk, the Sea Woman, was described as "the lubricous one". If the people breached certain taboos, she held marine animals in the tank of her lamp. When this happened the angakkuq had to visit her to beg for game. In Netsilik oral history, she was originally an orphan girl mistreated by her community. Moon Man, another cosmic being, is benevolent towards humans and their souls as they arrived in celestial places. This belief differs from that of the Greenland Inuit, in which the Moon’s wrath could be invoked by breaking taboos. Sila, often associated with weather, is conceived of as a power contained within people. Among the Netsilik, Sila was imagined as male. The Netsilik (and Copper Inuit) believed Sila was originally a giant baby whose parents died fighting giants. Caribou Inuit is a collective name for several groups of inland Alaskan Natives (the Krenermiut, Aonarktormiut, Harvaktormiut, Padlermiut, and Ahearmiut) living in an area bordered by the tree line and the west shore of Hudson Bay. They do not form a political unit and maintain only loose contact, but they share an inland lifestyle and some cultural unity. In the recent past, the Padlermiut took part in seal hunts in the ocean. The Caribou have a dualistic concept of the soul. The soul associated with respiration is called umaffia (place of life) and the personal soul of a child is called tarneq (corresponding to the nappan of the Copper Inuit). The tarneq is considered so weak that it needs the guardianship of a name-soul of a dead relative. The presence of the ancestor in the body of the child was felt to contribute to a more gentle behavior, especially among boys. This belief amounted to a form of reincarnation. Because of their inland lifestyle, the Caribou have no belief concerning a Sea Woman. Other cosmic beings, named Sila or Pinga, control the caribou, as opposed to marine animals. Some groups have made a distinction between the two figures, while others have considered them the same. Sacrificial offerings to them could promote luck in hunting. Caribou angakkuit performed fortune-telling through qilaneq, a technique of asking questions to a qila (spirit). The angakkuq placed his glove on the ground and raised his staff and belt over it. The qila then entered the glove and drew the staff to itself. Qilaneq was practiced among several other Alaskan Native groups and provided "yes" or "no" answers to questions. Spiritual beliefs and practices among Inuit are diverse, just like the cultures themselves. Similar remarks apply for other beliefs: term silap inua / sila, hillap inua / hilla (among Inuit), ellam yua / ella (among Yup'ik) has been used with some diversity among the groups. In many instances it refers "outer space", "intellect", "weather", "sky", "universe": there may be some correspondence with the presocratic concept of logos. In some other groups, this concept was more personified ([sɬam juɣwa] among Siberian Yupik). Among Copper Inuit, this "Wind Indweller" concept is related to spiritual practice: angakkuit were believed to obtain their power from this indweller, moreover, even their helping spirits were termed as silap inue. The Inuit believed that all things have a form of spirit or soul (in Inuktitut: anirniq meaning "breath"; plural anirniit), just like humans. These spirits are held to persist after death—a common belief present in most human societies. However, the belief in the pervasiveness of spirits—the root of Inuit worldview—has consequences. According to a customary Inuit saying, "The great peril of our existence lies in the fact that our diet consists entirely of souls." Since all beings possess souls like those of humans, killing an animal is little different from killing a person. Once the anirniq of the dead animal or human is liberated, it is free to take revenge. The spirit of the dead can only be placated by obedience to custom, avoiding taboos, and performing the right rituals. The harshness and randomness of life in the Arctic ensured that Inuit lived constantly in fear of unseen forces. A run of bad luck could end an entire community and begging potentially angry and vengeful but unseen powers for the necessities of day-to-day survival is a common consequence of a precarious existence. For the Inuit, to offend an anirniq was to risk extinction. The principal role of the angakkuq in Inuit society was to advise and remind people of the rituals and taboos they needed to obey to placate the spirits, since he was held to be able to see and contact them. The anirniit are seen to be a part of the sila — the sky or air around them — and are merely borrowed from it. Although each person's anirniq is individual, shaped by the life and body it inhabits, at the same time it is part of a larger whole. This enabled Inuit to borrow the powers or characteristics of an anirniq by taking its name. Furthermore, the spirits of a single class of thing — be it sea mammals, polar bears, or plants — are in some sense held to be the same and can be invoked through a keeper or master who is connected with that class of thing. In some cases, it is the anirniq of a human or animal who becomes a figure of respect or influence over animals things through some action, recounted in a traditional tale. In other cases, it is a tuurngaq, as described below. Since the arrival of Christianity among the Inuit, anirniq has become the accepted word for a soul in the Christian sense. This is the root word for other Christian terms: anirnisiaq means angel and God is rendered as anirnialuk, the great spirit. Humans were a complex of three main parts: two souls (iñuusiq and iḷitqusiq: perhaps "life force" and "personal spirit") and a name soul (atiq). After death, the iñuusiq departed for the east, but the other soul components could be reborn. Some spirits have never been connected to physical bodies. These are called tuurngait (also tornait, tornat, tornrait, singular tuurngaq, torngak, tornrak, tarngek). Helpful spirits can be called upon in times of need. Some tuurngait are evil, monstrous, and responsible for bad hunts and broken tools. They can possess humans, as recounted in the story of Atanarjuat. An angakkuq with good intentions can use them to heal sickness and find animals to hunt and feed the community. He or she can fight or exorcise bad tuurngait, or they can be held at bay by rituals; However, an angakkuq with harmful intentions can also use tuurngait for their own personal gain, or to attack other people and their tuurngait. Though once Tuurngaq simply meant "killing spirit", it has, with Christianisation, taken on the meaning of a demon in the Christian belief system. An angakkuq (Inuktitut) is a spiritual healer and ceremonial person in traditional Alaskan Native religion. Angakuit is the plural of angakkuq. The angakkuq has largely disappeared in Christianised Inuit society, but has traditionally functioned as a mediator with (or defender against) the spirits, as well as a healer and counselor. Angakkug are held to be born with their gifts and not trained, although they have employed traditional ceremonies that involve drumming, singing, and dancing. Anguta: gatherer of the dead; he carries them into the underworld, where they must sleep for a year. Igaluk: the moon god and brother to the sun, Malina. He chases her across the sky. Malina: the sun goddess and sister to the moon, Igaluk. Qailertetang: weather spirit, guardian of animals, and matron of fishers and hunters. Qailertetang is the companion of Sedna. Sedna: the mistress of sea animals. Sedna (Sanna in modern Inuktitut spelling) is known under many names, including Nerrivik, Arnapkapfaaluk, Arnakuagsak, and Nuliajuk. Tekkeitsertok: the master of caribou. Qalupalik is a myth/legend told by Inuit parents and elders to prevent children from wandering to the shore. Qalupalik are human-like creatures with long hair, green skin, and long finger nails that live in the sea. They wear amautiit, in which they carry away babies and children who disobey their parents or wander off alone. They take the children underwater, where they adopt them as their own. Qalupaliks have a distinctive humming sound, and the elders have said you can hear the Qalupaliks humming when they are near. Up to today the Qalupalik story is still being told in schools and books, and by parents who don’t want their children to wander off to the dangerous shore. The myth was adapted as a 2010 stop motion animation short, Qalupalik, by Ame Papatsie. Saumen kars or 'Tornits' are the Inuit version of the hairy man or yeti myth. Qallupilluit are "troll-like" creature that come after misbehaving children. ^ Texts of mythology Sacred text.com. Retrieved 26 January 2013. ^ Qitsualik, Rachel Attituq (24 September 1999). "Mr. Holman dreams: Part One of Two". Nunani. Nunatsiaq Online. Retrieved 26 April 2016. ^ "angakkuq". Asuilaak Living Dictionary. Retrieved 2007-04-24. ^ "angatkuq". Asuilaak Living Dictionary. Retrieved 2007-04-24. ^ This is the Inuktitut name. For the same role in other Inuit dialects, see angakkuq. ^ Papatsie, Ame. "Nunavut Animation Lab: Qalupalik" (Animated short). NFB.ca. National Film Board of Canada. Retrieved 7 November 2011. ^ "Qallupilluit - from the Inuit tribes, a "troll-like" creature". Franz Boas (1888) The Central Eskimo. (p.212-213). Retrieved 18 February 2012. Lowenstein, Tom (1992). The Things That Were Said of Them : Shaman Stories and Oral Histories of the Tikiġaq People. Asatchaq (informant); Tukummiq (translator). Berkeley, CA: University of California Press. ISBN 0-520-06569-7. Laugrand, Frédéric; Jarich Oosten; François Trudel (2000). Representing Tuurngait. Memory and History in Nunavut, Volume 1. Nunavut Arctic College. Tornrak, the 1990 opera by John Metcalf features several spirits in the Arctic scenes. The Terror, Dan Simmons, Horror novel, 2007. Video game Penumbra: Black Plague by Frictional Games. The Infected are the main enemies serving the hive mind Tuurngait. Brian Morris (2006). Religion and Anthropology: A Critical Introduction. Cambridge University Press. ISBN 978-0-521-85241-8. Hall, Edwin S. The Eskimo Storyteller: Folktales from Noatak, Alaska. Knoxville: University of Tennessee Press, 1975. Spalding, Alex. Eight Inuit Myths = Inuit Unipkaaqtuat Pingasuniarvinilit. Ottawa: National Museums of Canada, 1979.